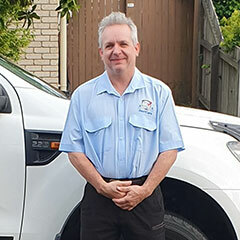 David Grant has been in the pest management business for over twenty-five years and will be able to use this experience to advise you on the best methods available for safeguarding your property against termites and other pests. David ran his own business in the Central West District of Queensland - from Longreach servicing Winton, Barcaldine and many outlying towns and areas. For many years he had the contract to look after the sewerage systems of Longreach. Having been entrusted to service such landmarks as the Tree of Knowledge in Barcaldine, and the Australian Stockman's Hall of Fame in Longreach, David has many years experience with safe and effective termite treatments and pest control. He has worked in areas from Redcliffe and Caboolture, to the Gold Coast with a private pest control company since moving to Logan. © Copyright A1 Protect Termite Management 2018.